Our Double Chocolate Chip Cookies are a true chocolate lover's friend. They are quick to make, delicious, and keep well. This recipe is for those of us who can't get enough chocolate! 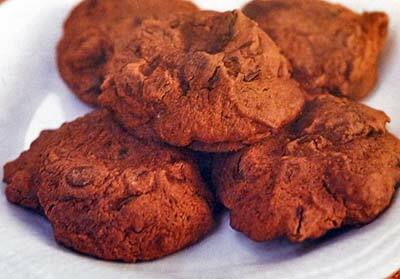 Dark cocoa-enhanced dough, bursting with semisweet chocolate chips that bakes up chocolatey, chewy and crisp. Make them as directed or turn them into chunky Chocolate Chocolate Chip Cookies by adding up to 2 cups of your favorite additions like peanuts, raisins, or dried cranberries. If you ever enjoyed a Chunky candy bar - a luscious cube of chocolate full of raisins and peanuts - you realize what a wonderful combination this is. Bake up a batch of Double Chocolate Chip Cookies for all your favorite chocolate lovers. They will be so glad you did. These cookies need to chill for at least 2 hours before baking. In a medium size bowl combine the flour, cocoa, baking soda and salt and set aside. In a large bowl with an electric mixer on medium-high speed, beat butter until creamy, about 2 minutes. Add sugars gradually, beating until light and fluffy, about 3 minutes. Stop to scrape down the sides of the bowl once or twice. Add the eggs, one at a time, beating well after each addition and scraping down the sides of the bowl, and then the vanilla beating until smooth. Cover with plastic wrap and place in the refrigerator for at least 2 hours (or up to 8 hours) to let the dough thoroughly chill. Preheat oven to 375 degrees F. Line baking sheets with parchment or silicone liners. Drop chilled dough by heaping tablespoons onto lined cookie sheets, leaving about 2 inches between cookies. Bake for about 10 minutes or until firmed up but still a bit soft in the center. Cool on baking sheets 5 minutes then transfer cookies to wire racks to cool completely or enjoy warm! This recipe yields about 60 Double Chocolate Chip Cookies. To make chunky double chocolate chip cookies, stir in 1 cup dry roasted peanuts and 1 cup dark raisins or dried cranberries when adding the chocolate chips. Note: These double chocolate chip cookies will keep for one week in an airtight container at room temperature. 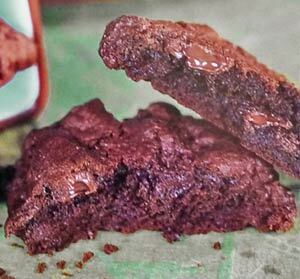 From start to finish, these Chocolate Quickies should only take about 30 minutes to make. If they don't get eaten that first day, they also keep well. You can easily store them for a week at room temperature, or more than a week when sealed tightly and kept in the refirgerator. In a large bowl with an electric mixer on medium speed, beat butter and sugar until soft, about 3 minutes. As needed, scrape down the sides of the bowl while mixing. Add the eggs and vanilla extract and beat until smooth, about 2 minutes. Scrape down the sides of the bowl and continue beating until very smooth, about 3 minutes. Slowly add the sifted flour mixture and mix just until incorporated. Using heaping tablespoons, drop cookie dough about 2 inches apart onto non-stick or parchment-lined baking sheets. Bake about 10 to 12 minutes or until firmed up around the edges but still a bit soft in the center. Cool on baking sheets for about 5 minutes then transfer cookies to wire racks to cool completely. This recipe yields about 3 dozen Quickie Chocolate Chocolate Chip Cookies. Preheat oven to 375F degrees. Line cookie sheet with parchment paper or silicone liner and set aside. In a mixing bowl, cream butter and brown sugar with an electric mixer on medium speed until light and fluffy. In a medium bowl, stir together the flour, cocoa powder, baking soda and salt. Gradually add the dry flour mixture to the creamed mixture and mix well. Drop tablespoonful of dough at least 2 inches apart onto prepared sheets. Bake about 8 to 10 minutes or until firm around the edgeswith a soft center. Cool cookies on baking sheets for about 2 minutes before transferring to wire racks to cool completely. This recipe yields about 48 Double Chocolate Chippers.